[Day 253, Page 273] We are still in Pip’s new high apartment, during the storm, with Pip and the convict. The convict found Pip’s address by writing to Wemmick. He tells Pip he is indeed the person who has made a gentleman of him. Pip is so taken by this news (having thought it to be Miss Havisham all along) that he has to sit down. This has been very generous of the convict! He admits he worked hard and did without so that Pip wouldn’t have to. The convict is so proud of what he has accomplished with Pip. (Pip is still repulsed by the man.) 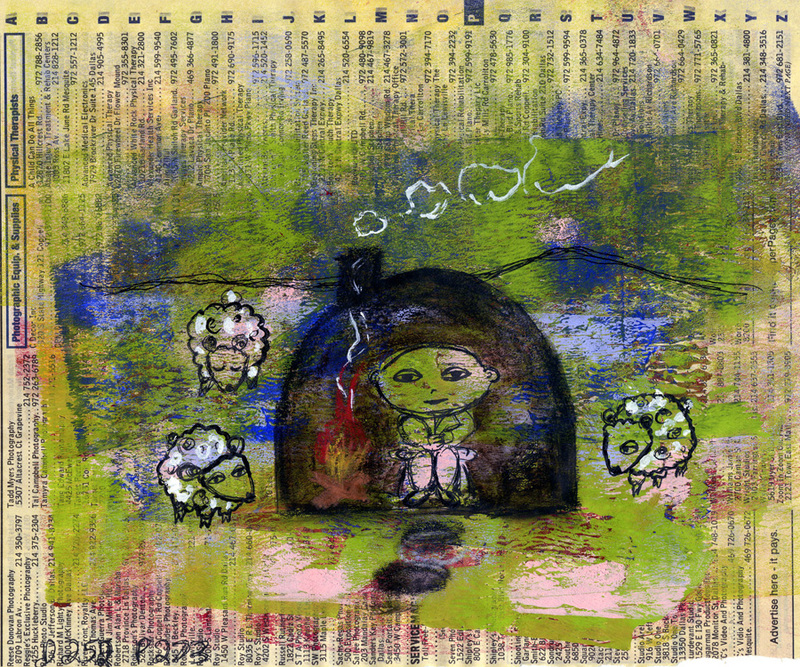 The convict tells of how he lived in a hut, herding sheep, all alone, thinking only of Pip. Pip recoils from his touch. I rolled some acrylic paint onto a phone book and did some painting and drawing on top of that. Here is the convict in his hut, in America, I believe. He called it the new country. I didn’t think you could make that much money from herding sheep, but what do I know about herding sheep? !